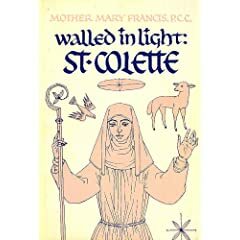 The life of Saint Colette, founder of Colettine Poor Clares and reformer. Colette began her reform during the time of the Great Western Schism (1378-1417) when three men claimed to be pope and thus divided Western Christianity. The 15th century in general was a very difficult one for the Western Church. Abuses long neglected cost the Church dearly in the following century. Colette reintroduced the primitive Rule of St. Clare in the 17 monasteries she established. fill you with all consolations. Poor Clare Colettines, Hawarden, WALES GB. The House of the Mother of God. The Sisters say that on the “left of this painting is a small icon representing Colette as the nurturer of life to whom we pray for the unborn, on the right is Colette and her vision of the golden trees, and the middle is representative of Colette leading others through the reed sea into the freedom of the Spirit.” The vision of the golden trees is explained here. Founder of Colettine Poor Clares (Clarisses), born 13 January 1381, at Corbie in Picardy, France; died at Ghent, 6 March, 1447. Her father, Robert Boellet, was the carpenter of the famous Benedictine Abbey of Corbie; her mother’s name was Marguerite Moyon. Colette joined successively the Bequines, the Benedictines, and the Urbanist Poor Clares. Later she lived for a while as a recluse. Having resolved to reform the Poor Clares, she turned to the antipope, Benedict XIII (Pedro de Luna), then recognized by France as the rightful pope. Benedict allowed her to enter to the order of Poor Clares and empowered her by several Bulls, dated 1406, 1407, 1408, and 1412 to found new convents and complete the reform of the order. With the approval of the Countess of Geneva and the Franciscan Henri de la Beaume, her confessor and spiritual guide, Colette began her work at Beaume, in the Diocese of Geneva. She remained there but a short time and soon opened at Besançon her first convent in an almost abandoned house of Urbanist Poor Clares. Thence her reform spread to Auxonne (1410), to Poligny, to Ghent (1412), to Heidelberg (1444), to Amiens, etc. To the seventeen convents founded during her lifetime must be added another begun by her at Pont-à-Mousson in Lorraine. 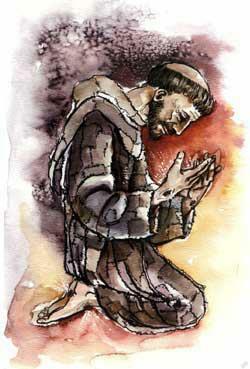 She also inaugurated a reform among the Franciscan friars (the Coletani), not to be confounded with the Observants. These Coletani remained obedient to the authority of the provincial of the Franciscan convents, and never attained much importance even in France. In 1448 they had only thirteen convents, and together with other small branches of the Franciscan Order were suppressed in 1417 by Leo X. In addition to the strict rules of the Poor Clares, the Colettines follow their special constitutions sanctioned in 1434 by the General of the Franciscans, William of Casale, approved in 1448 by Nicholas V, in 1458 by Pius II, and in 1482 by Sixtus IV. Sources: Text taken entirely from “The Catholic Encyclopedia, 1913,” which is in the public domain. who came to give a day of recollection. on the website of Poor Clare Colettine Community. God and Man was born. by whom He was conceived. of whom the Incarnate Word was born. for your glory and our salvation. and for the glory of Your Holy Name. the fountain of peace and sweetness and love. Dear Lady and especially loved in Our Lord Jesus Christ, as much and as humbly as I can and may, I recommend myself always to your good grace and in your devout prayers and supplications before Our Lord Jesus Christ. I beg you to strive ceaselessly to go from strength to strength in his most perfect love, remaining continually, strong and virtuous in his most holy and worthy service; for the kingdom is promised to those who set out on this way, but it is to those who persevere loyally that the crown will be given. And as long as we are alive there will be many perils, especially from our enemies, the world and the flesh, who day and night wage war on us in numberless ways. Against these we must arm and defend ourselves, for it is needful for us to conquer them if we do not want to be overcome ourselves, and, as Saint Paul says, we cannot have the victory without a battle, nor a crown without a victory. We can do nothing by ourselves without the aid and grace of God. We can neither do good nor resist our enemies. We need to turn to our good and true Master, Our Lord Jesus Christ and to beg him to equip us with his weapons so that we can the more surely overcome. These weapons, among others with which he was armed in this poor world, while bringing about and fulfilling the mystery of our redemption in the face of these three adversaries were: against the world, true and holy poverty from his birth until his death stripped naked on the cross: against the flesh, pure, holy and perfect chastity of heart and body, born and conceived of a pure, virgin mother: against the Adversary, perfect humility and true obedience right up to his death and all in perfect charity. And whoever is thus armed can go forward into battle with sure heart. In short, these are the weapons with which he has wished to equip those men and women whom by means of his grace he has wished to call into his service, and who have wanted to follow him in the life of the Gospel and the way of the Apostles. And I beseech him in his infinite goodness always to watch over and guard you completely, and so to enlighten you with his grace, that you may serve him always and endlessly, and love Him in the way of life which is most pleasing to him, and fight for him loyally under the banner of his Church. Thus you will be able to love him everlastingly and reign in his glorious, heavenly palace, for ever and ever. Colette born miraculously to her aged parents Margaret & Robert was at 14 somewhat stunted in growth and is recorded as having the body of a nine year old, this was of great concern to her parents, on account of their age as to what would happen to Colette when they died. Colette herself was happy enough but it troubled her to see her parents concern, and so she obtained permission to make a pilgrimage to Our Lady at the Shrine of Notre De Brebieres, she made the pilgrimage on foot. She touchingly and trustingly asked Our Lord, “ Lord do you wish me always to be so small?”… and petitioned Mary to help her grow , with this prayer, now so well known. A miracle occurred when she stood up a miracle had occurred, she had grown by several inches. Oh how pleasing is the simple prayer of a child to her heavenly Father & Mother Mary. Whatever we may lack in the way of health, mobility, character, let us also say, “ Lord make me tall in paradise . . .” for in the new WORLD of God all things will be made new. On those who cannot sleep tonight. On the sick and those terminally ill.
On those tempted to suicide. On the homeless with nowhere to go. On those who live in fear and anxiety. On victims of addiction of any kind. On those who sell themselves. On women seeking an abortion. On those who suffer domestic violence of mind or body. On those tempted to do evil. On those imprisoned in lies and wrong choices. On those who are dying tonight. For those who have accepted terrorism as their creed. R/ Lord, enlighten and change their hearts. For those who promote war. For those who profit by war. For those who commit acts of violence in God’s name. For those in the grip of hatred. For those who commit acts of violent abuse against children. For those in situations of violence and war. R/Lord, be their strength and protection. For refugees driven from their homelands. For children separated from their parents by war. For the victims of abuse or trafficking. For hostages who wait in fear. For those suffering from epidemic diseases. For those without recourse to adequate medical help. For doctors and nurses on duty. For all who will give birth tonight. For all those who will go to the help of others tonight. For all the children of God. R/Lord, we give you thanks and praise. For all who live the covenant of marriage in joy. For all new life conceived tonight. For all who keep vigil in your presence this night. For those who support us [Poor Clare Colettines] in our [their] life of prayer. For all those who have responded to the call of your love. For your Holy Church spread throughout the world. For your holy angels whom you send to protect us. For the prayers of your saints in heaven. For those who this night will come before your throne. For those waking to a new day on other shores. For the gift of your love which can never be defeated. convert to your love all who do evil. and may your sun rise on a new world. of those who long to conceive a child and of sick children. She is a healer of the sick. 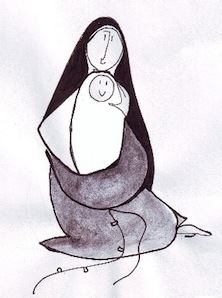 The Little Sisters of Ty Mam Duw use the following format for their night prayer: (1) Chaplet of Divine Mercy (2) Matins of the Divine Office (Office of the Readings) and (3) The Poor Clare Colettine Night Litany.